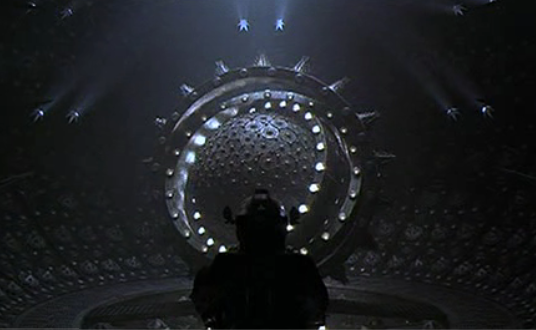 "Event Horizon" came out when I was in high school. I saw it in the theatre with my boyfriend. It was nothing new; just another entry into the horror/scifi cross-over genre. But we loved it none the less. 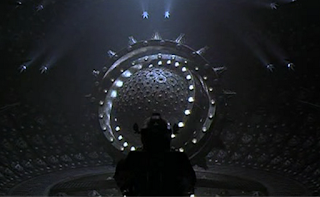 The Event Horizon is (possibly) the most poorly designed ship in all of scifi history; someone in set design went to town taking the ship from "Alien" and exponentially increasing the haunted-house elements to create a terrifying environment. Too bad no one stopped to ask, "think this thing would fly?" or "why would you have that on a spaceship?" There's hardly any lighting (the ship is constantly shrouded in darkness). Some rooms are made of spikes, twisting metal, or otherwise life-threatening elements. The medical bay is filled with what look like instruments of torture. Why is the center of the ship filled with a fish tank reminiscent of that at the Boston Aquarium? Who built that stupid hallway thing between the sections of the ship? The internal passageways are made of open grates, bare circuit boards, and ominous green lights. But, clearly, the esthetic works. Even now. Don't believe me? Just look at "Pandorum". The CGI is pretty terrible (now); but hey. When the movie came out, it was pretty impressive. You almost want to cut them some slack until you look at "Jurassic Park" and you're reminded that enough money spend can produce digital effects that actually remain impressive after (almost) 20 years. The plot has gaps; but then again, what movie doesn't? The dialog and acting can be a bit laughable. "This ship is fucked." Need I quote more? The rest of the cast leaves something to be desired but, that's easily forgiven based on the strength of Neill's performance. The gore factor is there. Shown some in flashes and quick cuts and some in head-on glory, there are enough bloody dismemberments, maiming, and other atrocities to make any horror fan wet with excitement. As an avid horror fan I have to admit that I've always been impressed by the Clive Barker-esque effects in "Event Horizon". Reminiscent of "Hellraiser", it really lends some credibility to an otherwise joke of a movie. Sometimes sentimentality wins out over my cynicism and I actually mange to write something positive about a crappy movie. Stated otherwise, "I still enjoy watching Event Horizon."